So I have been following this community driven computer for the last 6 months. During that time there has been a lot of discussion within the community about what the specs should be. 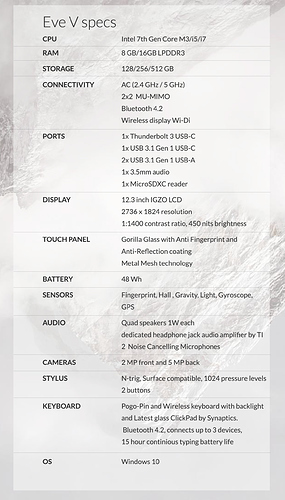 After much toing and froing the final specs list has been revealed. I can honestly say that as a member of the community it has been very interesting to follow. It has been a long and bunny road but we have reached the end point. This list of spec’s does look mightily impressive especially as this will be one of (possibly the first) Kaby-Lake computers. For those of you not ofay with Intel’s latest chipsets, that is what we have here the latest and greatest that Intel can offer. If you wish to know more click here. But the more important question is why would.i buy this over say a Surface Pro 4? Well the main reason for this device to exist is that the chaps at Eve have set out to make something better than what has been done by Microsoft so far. Now although I have not had the chance to see the machine in person (no-one outside of the Eve team have yet). I have seen enough to know that this could be a very good competitor to the Surface line. 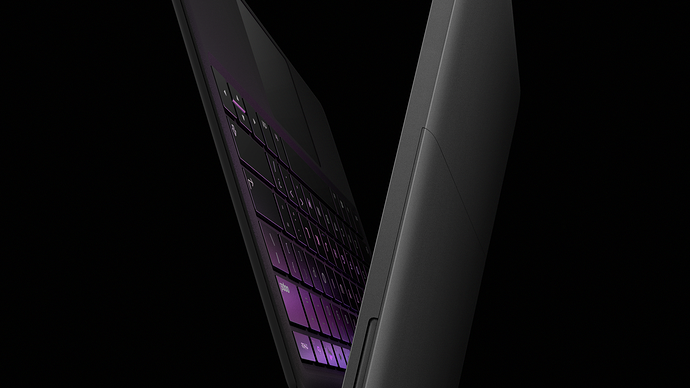 The design does look stunning and there are some very nice touches like having quad speakers and a wireless and connect able keyboard aka “Type cover” style. The keyboard even has a battery built into it thereby allowing the wireless function. In addition to this, we find an RGB backlight to allow for customisation which is still being finalised. 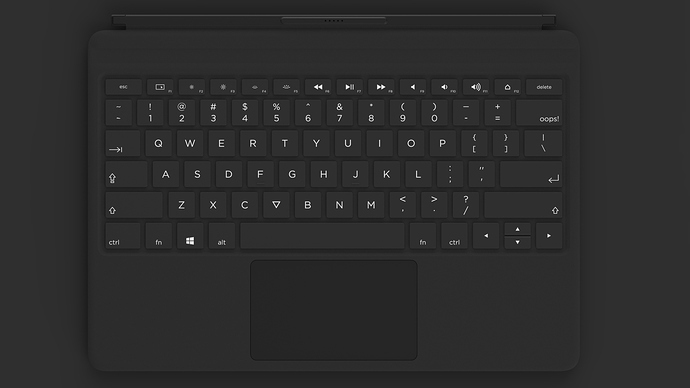 The keyboard will have the following features. Yes, you read that last line correctly the backspace key has been replaced with an “Oops! Key” This is just a bit of fun really and something that came again from much debate within the community. Eve is considering to sell a conservative backspace sticker for $1 for those who prefer a more sensible look. The trackpad on the V keyboard as it will be called is going to be the very best kit as it is using Synaptic technology. It is also going be substantial in size at 57 x 87mm which will make for easy gesture input. It will also support 15 hours of typing time with the backlight turned off. Along with the large touchpad, the Eve will also support pen input with and N-Trig digitizer with the same technology that is being used by the Surface line of products. This means that you will even be able to use the Surface pen, which is handy as you will not get one in the box. This decision was made as many community members did not find the need for the pen. It will be available as an extra if required. Again you desire a pen then you well be able to get an Eve made one which will be optimised better for the Eve V.
Another thing not to be found on the Surface is that the power key will double up as a fingerprint reader. This will allow for secure login in not just to the system via Windows Hello but into certain apps much like we now do our phones. Ports as always been quite a contentious issue for the community and thankfully due to the relative thickness of the device Eve have managed to cram in several ports including 1x Thunderbolt 3 (USB-C form factor), 1x USB 3.1 Gen 1 (USB-C form factor), 2x USB 3.1 Gen 1 (USB-A form factor), 1x 3.5mm audio, 1x MicroSDXC reader. This is defiantly a step up from the Surface Pro 4 and leaves even the new Macbook a little confused. Lastly a big pain point for anyone who works in a mobile oriented manner, battery life. Well, one of the benefits of making the device a wee bit thicker is that I allow more from for batteries to be crammed in. Eve has shoehorned a 48wh battery into the shell that is still under 10mm in thickness! 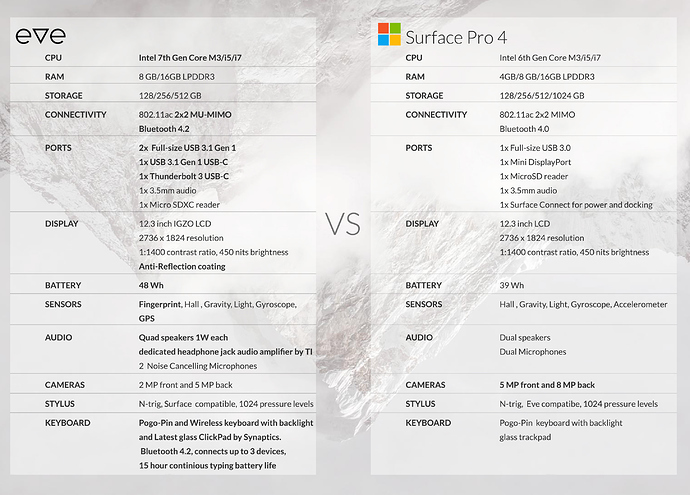 So that about sums up all the key points of what has been done with the Eve V. Here is a direct comparison to the Surface Pro 4 for your reference. The good news is that if you are wanting this fantastic looking machine then you will not have to wait much longer as the Indiegogo campaign will be launching very soon. We will see the device go live on IGG in the 21st (exact time to be revealed). So keep your eyes peeled on the Eve website for knees of the launch if you are interested in getting hold of one.